In order to do this book justice, I have to confess that the way I read it almost certainly detracted from the impact it had on me. I read it in snatches, on my iPhone, on the bus. With sometimes a week or even weeks between each reading. Inevitably my experience was disjointed. I believe that had I read it as a paperback, or even on my iPad, with more continuity, my initial experience might have been different. Indeed re-reading it, or rather re-skimming it, I am seeing things I didn’t give myself the leisure to notice before. All that said, Kiss Me First is well worth reading. It’s really good on detail, both as to place and character. I know London, and I also know Spain, and the descriptions bring both places alive. The plot is original and well constructed and there are some startling twists. As to the characters, these are revealed slowly. Both of these factors make reviewing the book more difficult. You don’t want to spoil it for the reader by revealing too much information, yet need to give some detail to illustrate your comments. I didn’t pick upon many of the clues about Leila; the fault is mine. I now realise that, at the very beginning, I unconsciously created an image for her. I saw her character as somewhat akin to the endearing Juno, in the film of the same name. About a quarter of a way in my feelings changed and I began to feel very ambivalent towards her, then began to dislike her. It was only towards the end of the middle of the book that I began to see it differently. By then the clues had become less subtle but a more careful reading has revealed that they were there from the beginning. Maybe I’m too cynical or world-weary but I had my doubts about the set up from the start. This too is down to the writer’s skill although it meant that for me there was no great surprise in that respect. However, the introduction of a police enquiry very early on, and well placed snippets of information keep the plot moving forward. Especially the way Connor, a new character, is dropped into the mix in a way that indicates how important he is, but without telling you much else for some time. That too kept me reading at a point where I had begun to lose interest. I will never know for sure how much this was due to my disjointed reading pattern, but I did feel the book sagged in the middle. I know that for me it picked right up when Connor was introduced. I felt I owed it to the author to at least skim the book again before writing this review. Having started to skim I discovered so much wealth that I had not fully appreciated first time round. However, I’m still uncertain about it, but there’s no doubt it is different and well worth reading properly, giving it the attention it deserves, and not butterflying around the way I did. Norwegian by Night is subtle and complex while managing to be a very good read and a page-turner all at the same time. The compulsion to turn the page accelerates as the book progresses but in the meantime there’s all the richness of the prose and the story to keep you reading. Set, incongruously but very satisfactorily, against the backdrop of the Korean war and the Serbian – Kosovan conflict in former Yugoslavia, this is the story of Sheldon, an elderly Jewish man uprooted from his New York home to settle, reluctantly, in a run down area of Oslo with his granddaughter and her Norwegian husband. From its initial introspective and domestic scenes, it soon becomes a thrilling chase when a woman’s brutal murder compels Sheldon to go on the run with her small son. 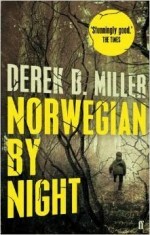 Nevertheless, Norwegian by Night is so much more than a well-written thriller. So much more. Picking out any one theme from this book would be to do it a disservice, as there are so many. Love, loss, regret, ethnicity, war and peace, family, adventure – all woven into a seamless tapestry that moves effortlessly from the Balkan warzones to Vietnam to the dense Norwegian forest. Backwards and forwards in time, threading present with past, memory with reality. Sheldon comes alive to the extent that, reading the acknowledgements, I find myself wondering – was he in fact a real person? While all the characters are well drawn and believable, even those who play minor roles, it is Sheldon who makes the book what it is. At this point I can’t prevent myself quoting from the author’s acknowledgements. “I am not sure how much of this book was written by me and how much was written by Sheldon himself. So I extend here my thanks to him for all his assistance. Which isn’t to say he was easy to work with.’ And this is what makes the book so special. Sheldon comes alive to the extent that, reading that acknowledgement, I find myself wondering – was he in fact a real person? Was he someone who collaborated with the author to create the story? I don’t think so, except in the sense that so often it’s characters make the decisions, not the authors. A living, breathing mass of contradictions and emotions.So real you want to reach out and hug him. So here you have this prickly old man, over eighty, with his regrets and his idiosyncrasies. His sharp edges and his, often well hidden, tenderness. Is he a reliable narrator or is he suffering from dementia? Did he serve in the army as a clerk, as he first told his wife, or was he a sniper as he later claimed, to her disbelief? Is this just a manifestation of his declining years? He speaks to his dead comrades. He mourns his son Saul and blames himself for his death. Yet he has the presence of mind to keep one step ahead of his enemies. I was astonished to discover that this is a debut novel. The author’s background in policy and international relations and security serves him, and us, well in this nuanced and sophisticated book. A book moreover which pulls off the difficult feat of keeping the tension and interest going – and keeping us guessing – right to the very end. However, I believe his greatest achievement is Sheldon. A living, breathing mass of contradictions and emotions. So real you want to reach out and hug him. If he’d let you. Which he probably wouldn’t.